He hadn’t held a bow before, but he’s not new to weapons. He aims through the scope with expert calm, arms taut with cool anticipation. The arrow hits the target cleanly. His satisfaction is visible; what we can’t see, though, is his traumatic brain injury from a combat blast in Afghanistan which left him with anxiety, depression, and issues with memory, balance, and sleep. Before the next shot he pulls deep nasal breaths that move his belly. He stills the breath when it’s time to release the arrow. 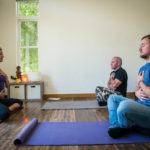 He’s learning breath progressions that help him hit the mark in archery, but the real aim of this retreat is to give him breath for healing at home. Since 2009 I’ve taught wellness for Challenge Aspen Military Opportunities (CAMO). 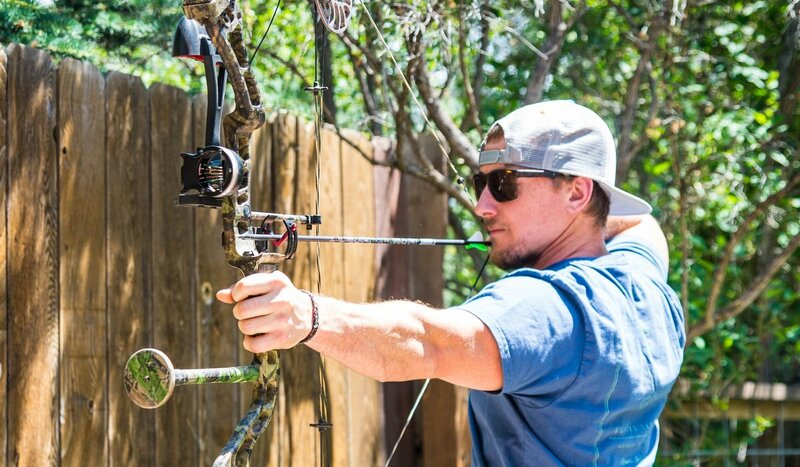 CAMO offers adaptive sports camps to the ever-growing numbers of wounded veterans. We give holistic training in four areas: sleep, functional movement, nutrition, and breathwork. I use these methods to effectively self-regulate and heal from my own traumatic past. Breathing is the easiest to learn and brings the quickest results. Breath creates conditions for healing by oxygenating cells, increasing CO2 tolerance, regulating reactivity, and creating relaxed presence. In 2017 a retired veteran I worked with through CAMO inquired how breath could help with archery performance. I became his breath coach, and he, a Level 3 Archery coach, taught me to shoot. Breathwork gave him tangible relief from combat-related symptoms. Archery gave me a way to experience relaxed power. We continue to train and cross-reference what’s working and what’s not. 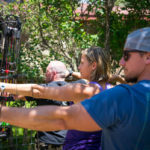 To help other people, we started Archery Breathing Camps at CAMO. Veterans arrive imbued with combat marksmanship training. Here they get to employ that skill with a silent weapon in the peace of quaking aspens. Our group spends days in nature shooting, eating, resting, and breathing. Participants breathe intentionally with bows more than yogis in any Ashram. Learning comes from doing, so having people breathe arrows into targets for several days teaches the brain to breathe instinctively when managing stress in the grocery store or in traffic. 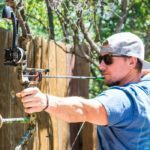 Our testimonials now include a veteran who credits the breathwork he learned with archery for saving his life. It works because archery includes both motivation and metrics for using breathwork. The motivation is to achieve accuracy, which requires mind/body presence; the metric is in the target, which reflects how centered (or not) the breath was for the shot. It’s adaptive and brings people outdoors for time spent in peace and power. Plus, it’s addictive. After last summer, I bought a bow and have shot hundreds of arrows to put my own breath to the test. 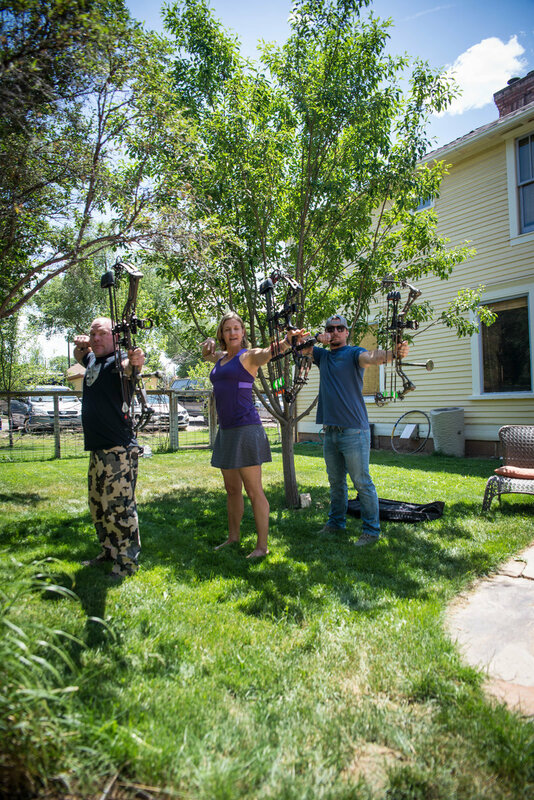 We are donating a day to breathe archery with civilians where all proceeds support CAMO. 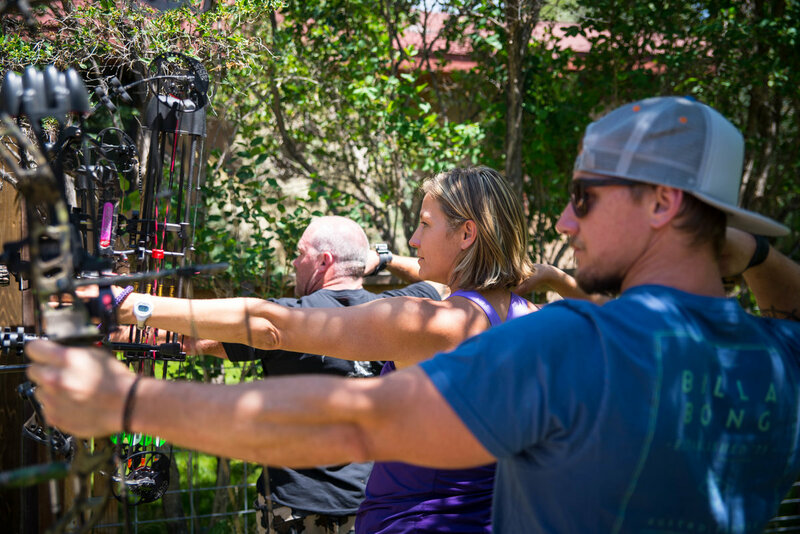 On Friday July 13, join us for a retreat day of yoga, breathwork, and archery for all levels held at CAMO’s Whispering Winds Ranch near Reudi Reservoir. The suggested donation is $500 for expert archery and applied breathwork training you’ll use for life. 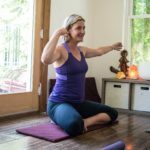 Emily Hightower has been an adventure and wellness guide for over 20 years. Her archery coach mentioned above served in the military for over 17 years and now competes internationally. To enroll in CAMO’s Breathing Archery Day for civilians or learn more about the program, contact Emily directly at Emily@ondalu.com. "Learning comes from doing, so having people breathe arrows into targets for several days teaches the brain to breathe instinctively when managing stress in the grocery store or in traffic."